Wow. Major respect to those who decorate cookies for a living. It is hard. Not only hard, but it is extremely detail-oriented and detail-oriented and detail oriented. The technique of outlining and flooding seems to be “easy,” but oh no. Not at all. If you want to do two colors, it adds more details and more steps to take. These required a lot of patience, and I only used two colors!! While it was a great trial run, I personally will stick to chocolate chip and crinkle cookies. You can eat them right away. I used a chocolate cookie dough as my base. It must be chilled first for one hour before you can roll the dough out. The cookies are then cut out, chilled one more time, then baked. The color will lighten during baking. 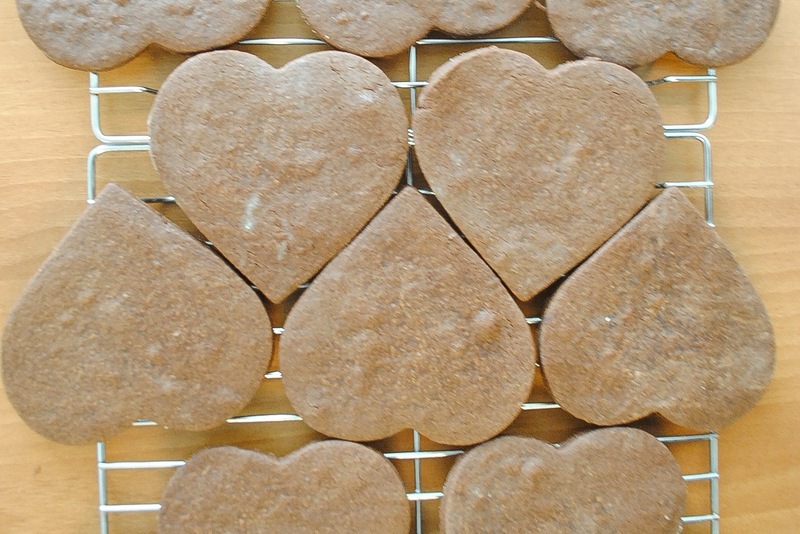 Allow them to cool completely on cooling racks before you begin to decorate. While they are cooling, make the icing. While the icing is relatively easy to make, bag, pipe and clean up, the part I struggled with most was the coloring. In cases where you have to maintain a certain consistency of something, I use food coloring gel. It is much more concentrated than the liquid and does not require as much to get the color through. Once I colored the icing, I separated them into two batches– a small batch for outlining was put into a piping bag with a #2 tip, and a larger batch for the flooding, which I put into a squeeze bottle. 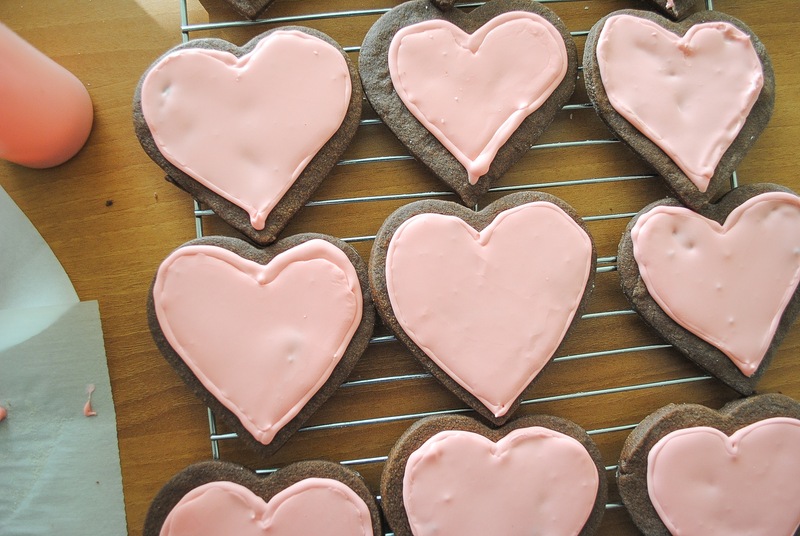 For the larger batch for flooding, you want the icing to be thinner than the outlining so I added a tablespoon of water. You first outline whatever shape you want, then use the flooding icing to fill the space between. As you can see from the photo below, I still need practice. The outlining icing was too thick and I let too much time pass between the outlining and flooding which is why there is the line between them. To make the cookies look more interesting, I added brown and purple food coloring gel to the outline icing after all was done. I then made a zigzag pattern to spice things up. Let the icing completely dry at room temperature and then enjoy! This is truly a labor of love. 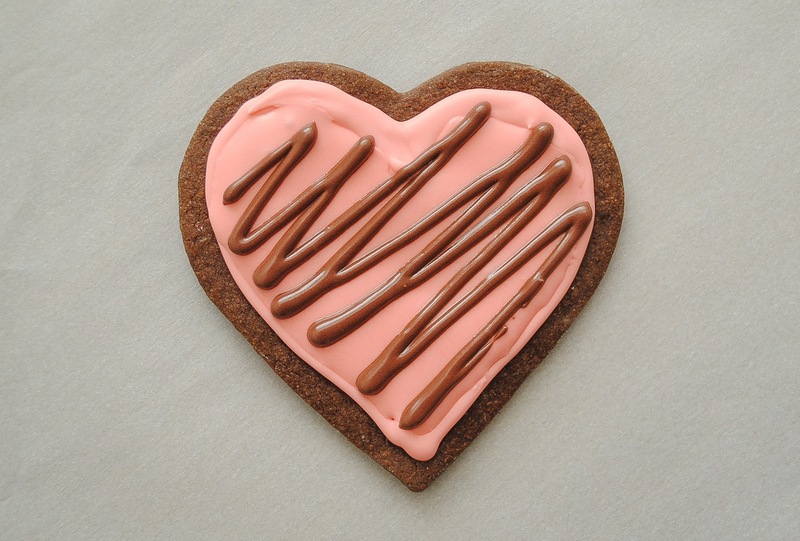 Both cookie and icing recipe from Sweetopia. As this was my first time trying this method, I cut both recipes in half. I have given you original recipe and measurements below. Add eggs slowly and mix. Scrape down the bowl with your spatula at least once and mix again. Add liquid vanilla extract. Stir briefly. Sift your dry ingredients together. (Flour, cocoa powder and salt). Add all of the flour mixture to the bowl. Mix on low speed for 3o seconds. When it clumps around the paddle attachment, it’s ready. Do not to over mix the dough. Roll the dough out between two parchment papers. Place onto baking tray and refrigerate for 1 hour. Roll out the dough further if you need to, and cut out cookie shapes. Place on parchment paper-lined baking sheet. Re-roll scraps and repeat. Put cookie dough shapes back into the fridge for 10 minutes to 1 hour to chill again. 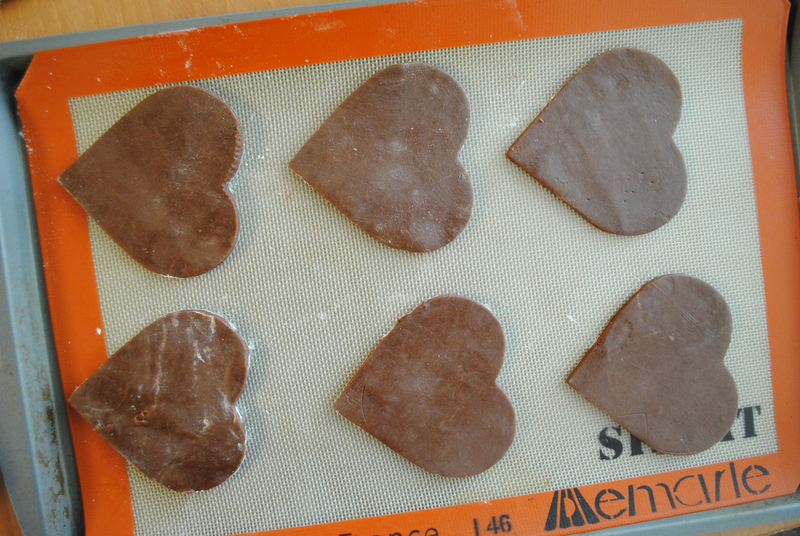 They will then hold their shape better when baked. Bake cookies for 8-12 minutes or until the center of the cookie no longer looks wet. The baking time will depend on the size of your cookie. 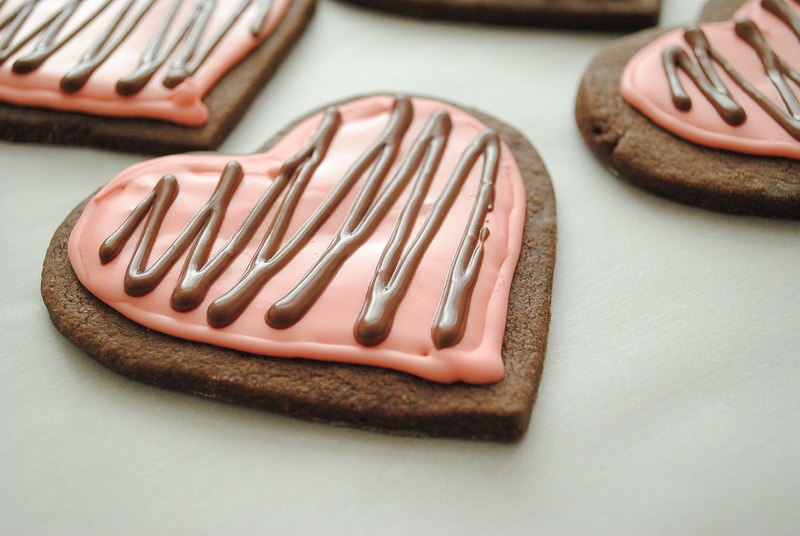 Let cookies cool to room temperature and decorate! 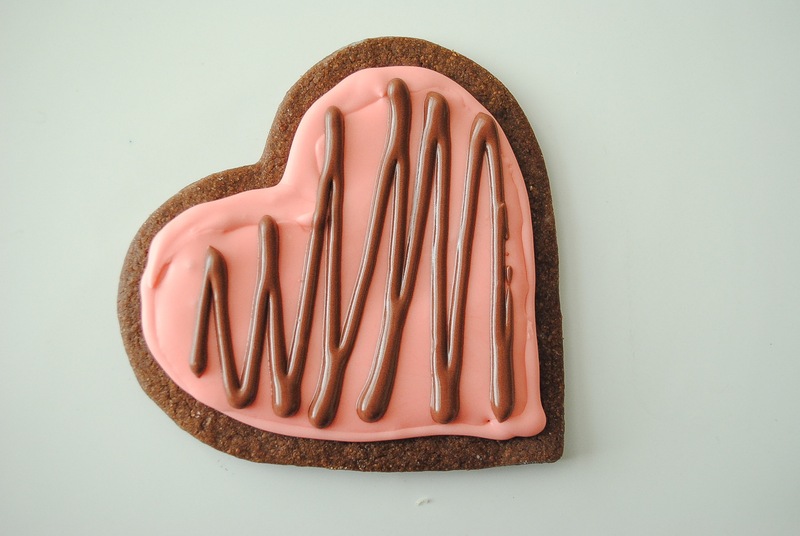 Tint with food colorings or thin the icing with small amounts of warm water to reach the desired consistency. More about the icing consistency can be found through this video.